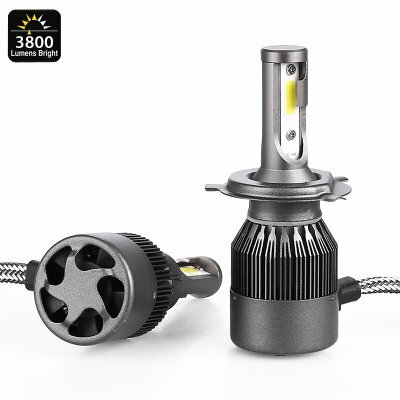 Successfully Added LED Headlight Bulbs - Type H4 Light Interface, 6500k White Light, 3800 Lumen Each, COB Chip, Plug And Play, 30000 Hours Lifespan to your Shopping Cart. Light up all that lays ahead of you with these LED headlights for your car. From now on, you’ll never be left out in the dark again while driving those empty roads at night. These car LED lights are suitable for vehicles that feature a type H4 light interface. They feature a compact design; however, produce a magnificent amount of light. With their plug and play design, you’ll be able to simply install them to your vehicle without needing any technological knowledge. From now on, you’ll be able to head out after dark with confidence. This LED headlight bulbs will provide you with a steady source of light and significantly increase your safety on the road. Thanks to its COB technology, these LED headlights are energy efficient and feature an extremely long lifespan. With a service life up to 30000 hours, these car lights will take you through numerous years of nighttime rides to come. These LED lights furthermore feature a waterproof IP67 design. Thanks to this, you’ll be able to use them in virtually any climate and weather condition. No matter where you’re located, these H4 car lights will provide you with a bright source of light after dark. Each of these LED headlights is capable of producing up to 3800 lumens. They support two different lighting modes. In high beam mode, these LED lights together produce up to 72W. When using low beam, 40W of pure 6500k white light is emitted. With so much strength at hand, these LED car lights are capable of lighting up all that lies ahead of you up to a distance of 200m. If you are looking for a new pair of high-end car LED lights, this bulb set is perfect for you. These LED Headlight Bulbs comes with a 12 months warranty, brought to you by the leader in electronic devices as well as wholesale electronic gadgets..